The Provision Cloud Hosts dialog box enables you to provision hosts. You can choose how many hosts to provision and where the hosts are provisioned, and you can select all necessary host configurations. On the sidebar, under Lab Resources, click Hosts. Click the Provision button or select Testing Hosts > Provision. On the sidebar, under Lab Resources, click Testing Hosts. On the My Performance Center navigation bar, select Resources > Testing Hosts. Click the Provision Hosts button. Important information You must have at least one cloud account and at least one host template linked to your project in order to provision hosts. Batch # Shows the number of the batch for which you are entering details. Hosts Amount Enter the number of hosts to provision in the batch. Remember that all hosts in the batch use the same account, location, and template, and have identical configurations. Account Select the cloud account to provision from. Select a suitable geographic location in which to provision the hosts. Make sure to select a location for which you have configured an appropriate host template. Host template specifies the hosts' purpose, hardware, machine image, and credits consumed per hour. 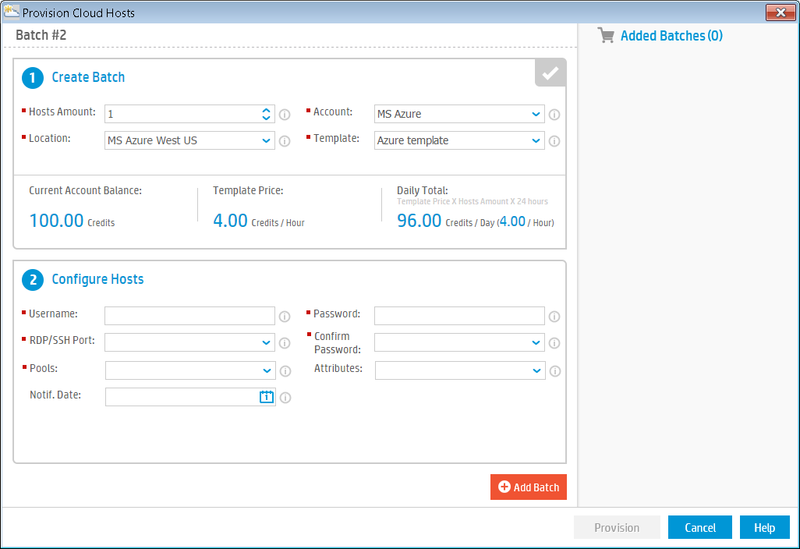 Select a host template that will match your testing needs. The list of available templates is based on your selected location. Shows the number of credits available in your account. Shows the cost in credits per hour of the selected template. Shows the total number of credits per day the batch will consume. Select a security group that allows the necessary access to your testing hosts. Security group specifies which inbound and outbound connections are permitted from the hosts, such as port 80 (HTTP) or port 3389 (RDP). Security groups are configured on your cloud provider's website, and must be created separately for each location. Only security groups configured for your selected location are displayed. For details, see Initial Cloud Settings Overview. Note: Not applicable for Microsoft Azure cloud accounts. Pools Select the appropriate host pools to which the newly provisioned hosts will be added. Select a key pair for which you have the private key. Key pair is used to generate the administrator password for Windows machines and to log in to Linux machines. Key pair is only relevant if you plan to remotely connect to your cloud hosts. Key pairs are managed on your cloud provider's website, and must be created separately for each location. Only key pairs configured for your selected location are displayed. Note: You must have at least one keypair in order to provision a host. For more details on key pairs, see Initial Cloud Settings Overview. Select host attributes that match the capabilities of the hosts. Host attributes are used to identify suitable hosts when running tests. Note: The attribute list can be modified from ALM Project Customization. For details, see the Application Lifecycle Management Administrator Guide: Customizing Project Lists. Enter the date to be notified if the hosts are still provisioned in the cloud provider. Hosts provisioned past this date will be listed in the cloud hosts daily digest report. Note: This is an optional field, however, it is recommend that you enter a value for better tracking of hosts that are past there due date. This value can modified from the the Host module. If you defined a pool of predefined IP addresses with your cloud provider, select this option to use those predefined static IP addresses to provisioninig your host. For more details on elastic IP addresses, see Initial Cloud Settings Overview. The user name of the user who connects the RDP/SSH port to the provisioned machine. The user name must meet the user name complexity requirements of the operating system that you are using for this virtual machine. Note: Only applicable for Microsoft Azure cloud accounts. The password of the user who connects the RDP/SSH port to the provisioned machine. The password must meet the password complexity requirements of the operating system that you are using for this virtual machine. Re-enter the password of the user who connects the RDP/SSH port to the provisioned machine. The port of the secure connection remote desktop. Add Batch Adds the selected batch to the cart. When you click Provision, all hosts in the cart are queued for provisioning. Added Batches Shows all batches that are to be provisioned . You can click the Delete Batch button to remove a batch from the cart. Deletes the selected batch and removes it from the cart. Provision Queues all batches in the cart for provisioning and opens the Host Provisioning report. For more details on this report, see Host Provisioning Report.